There were four Iowa class battleships built for the United States Navy, the others being Wisconsin, Missouri and New Jersey. Iowa set out on her first deployment August 27th 1943. She joined up with British warships soon after to assist in the search for Germany’s largest remaining battleship, the 42,000-ton Tirpitz. Although intelligence sources reported the German battleship was operating in Norwegian waters, the eagerly awaited battle between these two mighty warships failed to materialize as Tirpitz managed to evade detection. Iowa first saw action during an attack on the Japanese naval base at Truk/Caroline Islands February 16th 1944. She was credited with sinking the Japanese light cruiser Katori during the battle. 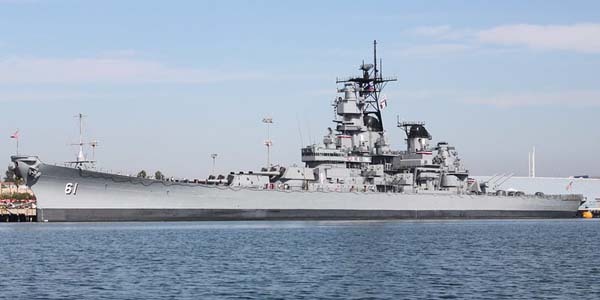 Above, USS Iowa at Suisun Bay near San Francisco in the mothball fleet, Large Image by achesonblog. Throughout the remainder of the Pacific War, Iowa was mainly used for shore bombardment and to protect troopships from Japanese aircraft. She saw action at the Marshall Islands, Wake, Saipan, the battle of the Philippians Sea, Taiwan, Luzon and the battle of Leyte Gulf. Iowa and 23 other US warships were caught in a typhoon December 18th 1944. The destroyers Monoghan, Hull and Spence went down in the raging seas with the loss of 765 of their crew. Iowa had to be put into Hunters Point shipyard/San Francisco for repairs as she damaged a drive shaft while battling through the storm. Iowa’s repairs were completed just in time for her to join Missouri and Wisconsin in the final phase of the war bombarding the Japanese mainland. Iowa and Missouri put into Sagami Bay to accept the surrender of the Yokosuka naval district August 27th 1945. Two days later, they steamed into Tokyo Bay to support the landing of the occupation forces. Missouri was later used as Admiral William F Halseys flagship for the Japanese surrender ceremony in Tokyo Bay September 2nd 1945. The Iowa class battleships also provided cover for US forces throughout the Korean War (June 25th 1950 - July 27th 1953). New Jersey was used to support US troops during American involvement in Vietnam (1960 - 1973), often being called on to fire her 16-inch guns over US servicemen’s positions to stop the advance of North Vietnam troops. Wisconsin and Missouri carried out shore bombardment during the Gulf War in 1991. Twenty-eight Tomahawk cruise missiles were also fired from Missouri at targets in Iraq. All four ships were placed in the reserve fleet in the 1990s. 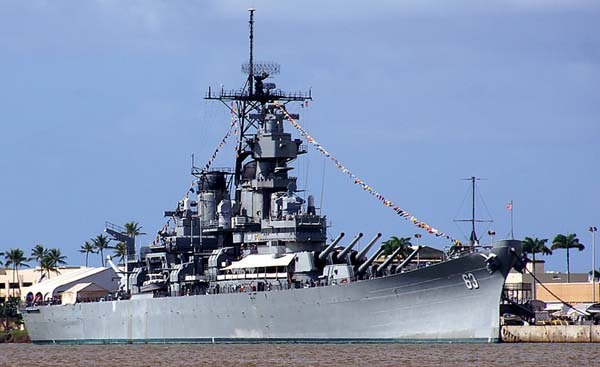 Missouri, as seen above, has been berthed at Pearl Harbor to serve as a memorial since 1999. Wisconsin has been operated as a museaum at Hampton Roads Navel Museum at Norfolk, Virginia since 2001, and New Jersey has served as a museum docked at Camden/New Jersey since 2000. Iowa will be berthed in the Port of Los Angeles adjacent to the World Cruise Center to serve as a museum from 2012. The US had 10 modern battleships built during WWII and 16 WWI era battleships available for WWII. Only three were damaged beyond repair, this being at Pearl Harbor on the 7th December 1941, the day before the US entered the war. The battleships damaged beyond repair were the WWI era Arizona, Oklahoma and Utah that was serving as a training ship. Oklahoma was raised for scrap and spares, the other two remain where they were sunk as memorials. The Japanese had two modern 18 inch gun battleships built during WWII and six other battleships that were either built during, or just after WWI, about 30,000 - 33,000 tons. All eight were either sunk or damged beyond repair during WWII.